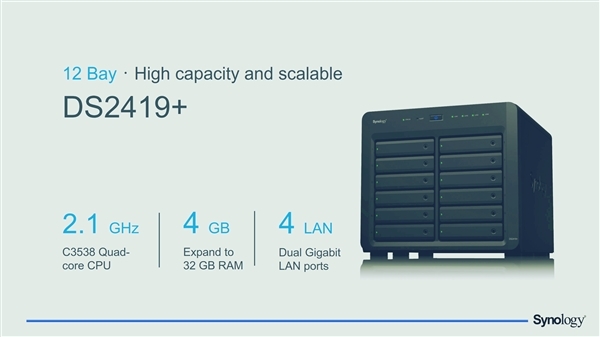 The president of Synology North America recently accepted an interview with Anandtech, and some NAS new product plans were also announced. It is reported that before the end of this year, Synology will update four NAS, two desktop, two rack-mount, pre-installed Synology features DSM system. Consumer desktop models are DS619Slim and DS2419+, the former is 6 positions, equipped with Intel Celeron J3355 dual-core processor (14nm Apollo Lake), 2GB RAM (expandable to 8G), dual Gigabit Ethernet port. The specifications of the DS2419+ are high, 12 positions, equipped with Intel quad-core Atom C3558 processor, 4GB RAM (expandable to 32GB), four Gigabit Ethernet port. Unlike the DS619Slim, the 2419+ hard disk has a PCIe port, can be used to expand M.2 SSD to improve system speed or connect to a 10G network card. 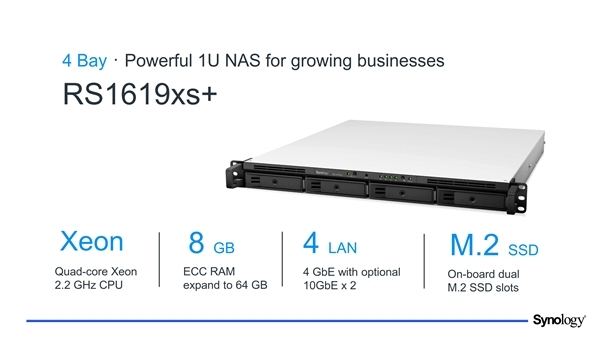 There are two types of rack-mount NAS, which are single-layer RS1619xs+, 4 slots, Xeon processor + 8G+4 Gigabit/2 Gigabit Ethernet ports, two M.2 SSD interfaces onboard; RS1219+ double-layer design, 8 groove. 2. For specific prices, Synology will be announced at the time of listing.